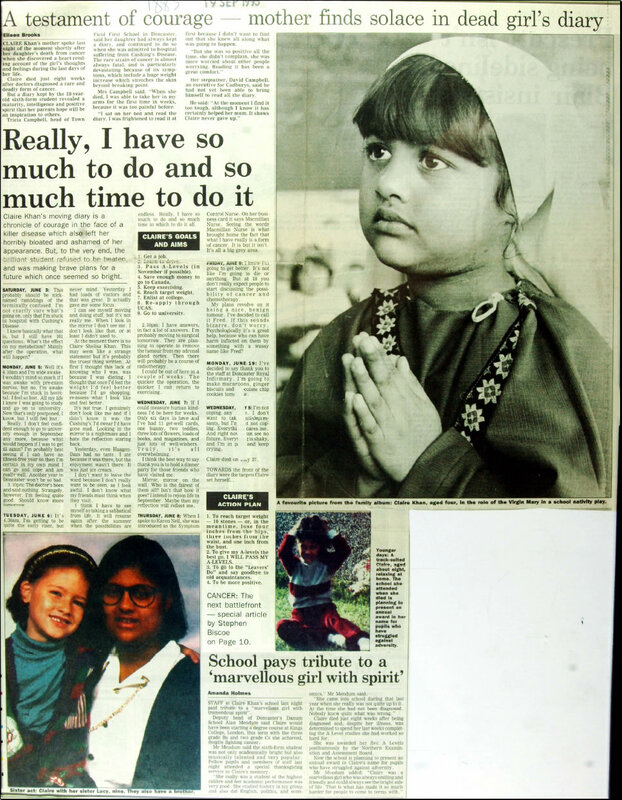 This educational website has been supported through donations to the Claire Khan Trust Fund, held within the University Hospital Birmingham Charities. We thank all of the individuals who made donations to the charity. 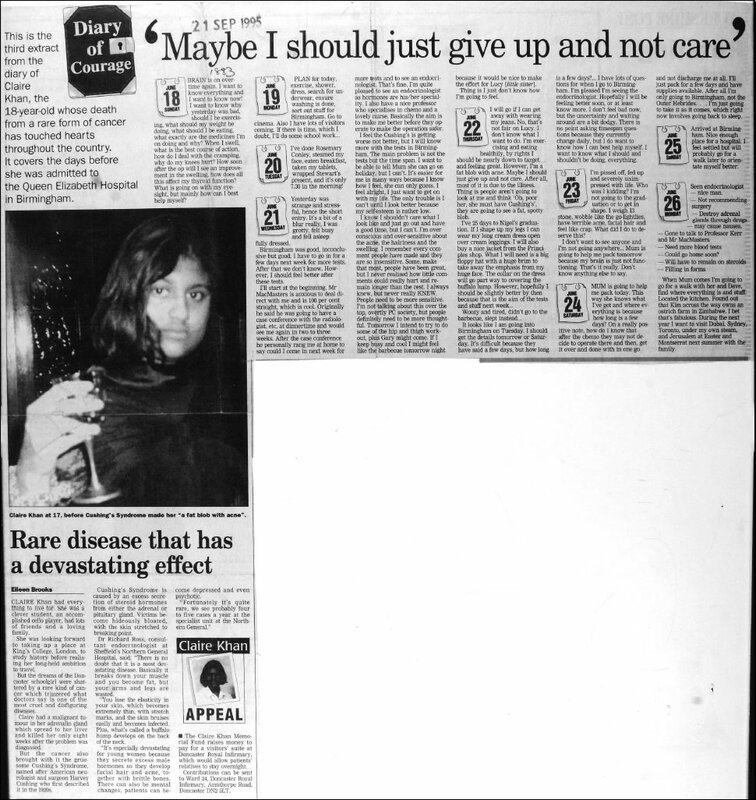 Claire Khan was a very bright teenager when adrenocortical carcinoma was diagnosed in 1995. She received treatment at the Queen Elizabeth Hospital in Birmingham as well as Doncaster Infirmary. One of Claire's immense skills was her written work. She painstakingly kept a diary throughout her illness and excerpts of this have been published in national newspapers. On the morning she died I was privileged as her mother to read the diary she had been writing for the eight weeks since her diagnosis. Unsure what I would find as we didn't share the full prognosis with Claire I was comforted to see my beautiful daughter kept her humour and her dreams till the end. On reflection I realise our decision not to tell her was due to my cowardice and maybe I should have trusted her more. I want to thank everyone who is contributing to this research and to the website as the world lost a star when they lost Claire and she would have wanted to play a part in ensuring her life meant something to others. 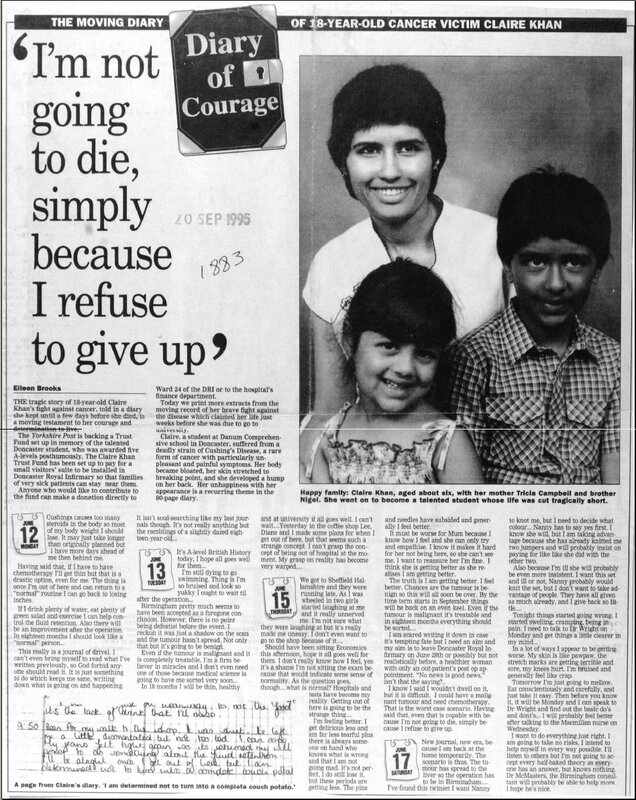 Her life touched the hearts of many and continues to do so through the many who read her diary and we hope that her writings in some way will raise awareness of this potentially horrible disease. Below is a fuller record of illness as witnessed through the pages of her own diary. It is important to stress that adrenocortical carcinoma is a very rare tumour, most tumours of the adrenal gland are benign. It is also important to stress that not all adrenocortical carcinomas are as aggressive in their behaviour - many patients have an excellent quality of life for many years after treatment and some are even cured. Nevertheless Claire's writings highlight to us all that adrenocortical cancer can be a devastating disease - research is required to understand why it happens and new therapies are needed to treat it.